Velox® is a modular connector system for high-speed backplane applications. It was specifically designed for markets with high performance requirements. The Velox® product series meets the demanding requirements of VITA46 systems. Four different types are available, and customised assembly is possible. This gives developers more flexibility when designing circuit board layouts. In addition, a 1.27-µm gold surface ensures the durability of the system. 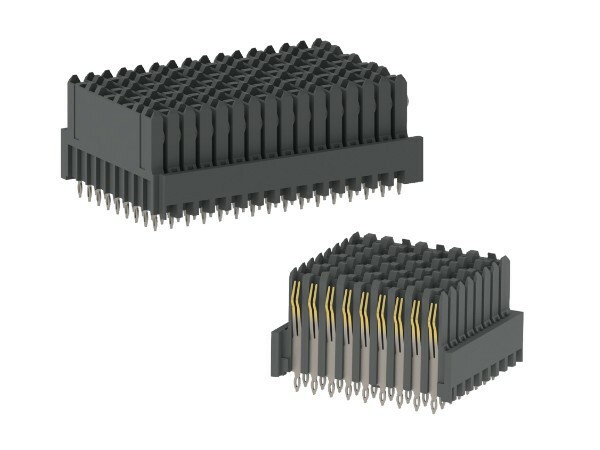 ept’s Velox® for VPX and VXS is a modular connector system for high speed backplane applications, specifically designed for backplane builders working for the defence industry and other markets that require high performance systems. VITA 46 technology brings several features to reality while maintaining the ability to operate with existing VME form factor boards. ept Velox encompasses four different connector types that can be connected together in a modular fashion. The Velox PCB, pinless, interconnect family comprises modular components which can be used in a variety of ruggedised, vibration resistant combinations.The product series is available in four different types with the flexibility for custom pin assembly allowing designers to create a flexible backplane design. The 1.27um (50 micro inch) heavy gold plated, double beam, resilient press-fit contacts with a rated durability of at least 200 mating cycles ensure a high-speed 10Gbps signal transmission during the entire lifetime of a system. Intermateability with custom or fully loaded connectors in the market from TE Connectivity (MultiGig RT, RT2 and RT 2R part numbers like 1410186-2, 1410141-2, 1410142-2, 1410140-2, 1410186-1, 1410140-1, 1410141-1, 1410142-1). Click here for cross references. Click here for electrical performance comparison between ept Velox and TE Connectivity MultiGigRT2 VPX board receptacles mated with the Meritec VPX to VPX cable assembly. Meritec conclude that the ept Velox VPX board receptacle performs the same can be considered a drop-in replacement for the TE Connectivity MultiGigRT2 board receptacle. The Vita46 specification, also known as VPX is an high-speed connector system. It transfers Gigabit Ethernet, PCI Express, Serial RapidIO, and InfiniBand, among others. The well known 6HE and 3HE European PCB form factors from VMEbus are supported in order to ensure maximum compatibility. This also makes hybrid systems a possibility. The VITA 46 standard was developed by VITA mainly for computer systems that need to be able to withstand high stresses, for example, military applications.